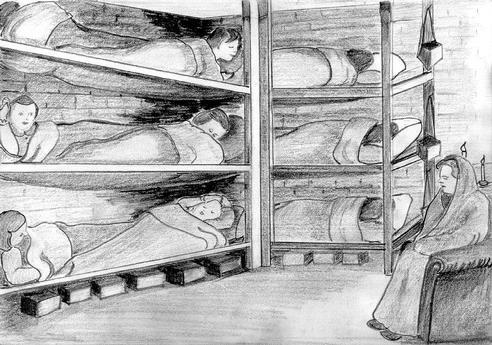 A memory drawing of the air raid shelter at 170 East Park Road, which was built to protect 12 girls, and  Ma . The air raid shelter was just next door to an Ammunition Factory! Gas masks were at the ready under the bunks. A drawing by Hazel Jacques. A bath in the zinc bath in front of the fire. This is a memory drawing of the house, 22 Lothair Road. 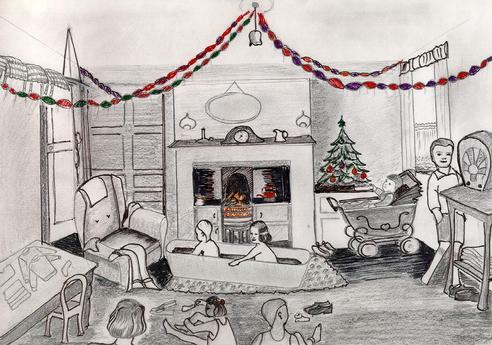 - That afternoon we had come home from school to go on a surprise car ride - we were bathed and had all clean clothes on - just to land up at the Recieving Home, Mill Hill Lane, Highfields - one week before Christmas 1942. A drawing by Hazel Jacques. 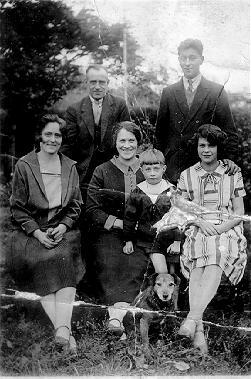 George and Emma Hunt [couple on the right] with his Mother [our Grandma] in the centre with her boy on her knee, Grandad is standing at the back. 1929. 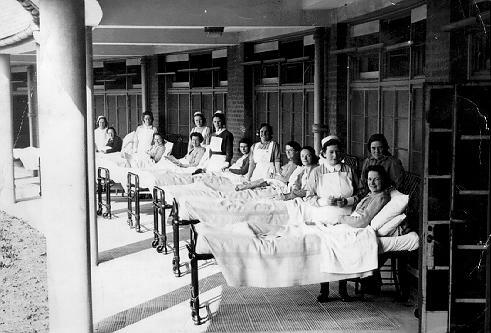 Our Mam, on the veranda,in Groby Road Hospital with tuberculosis - she died at 35 years old. 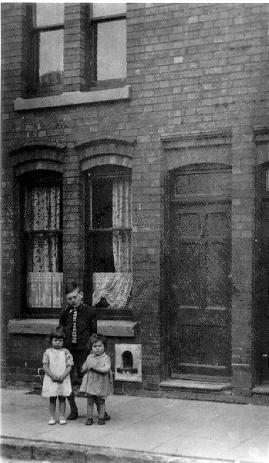 Outside our terraced house,1938, we stood to have our photos taken. Brother Norman had measels and is looking through the window. 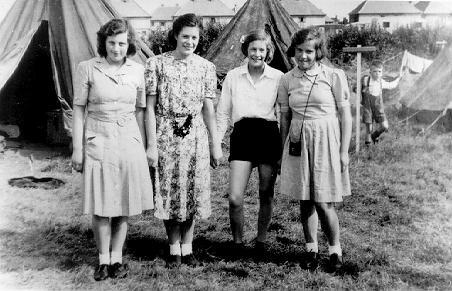 Miss Hammond and all the Girls Home at Winthorpe camp in 1946. 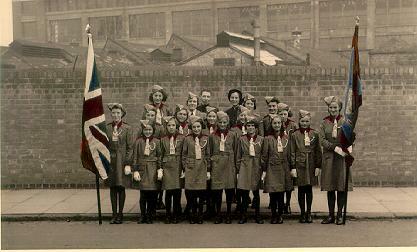 The Salvation Army 'Guards' - run by Miss Seeby - standing in Leicester Street, 1947, where we used to practise the band so that nobody could hear us! My sister Doris is third from the left in the centre row, and I m on her right in the photo. 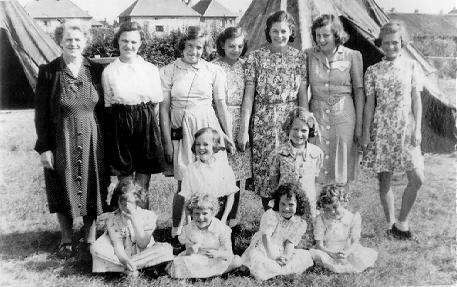 A camp photo at Winthorpe near Skegness 1946. Left to right - Margaret [died 1982], Me, sister Edna, and Winnie [died 1989]. 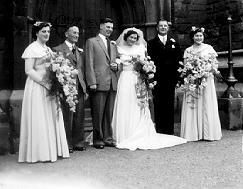 My wedding day, August 8th 1953. Left to centre - Doris, John Smith, Alan and me. 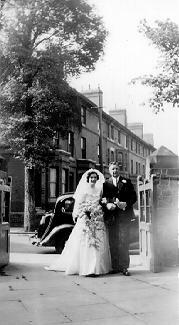 Hazel arriving at St Peters Church [Highfields] , on her wedding day, with Police Inspector Poole [giving me away]. 1953. 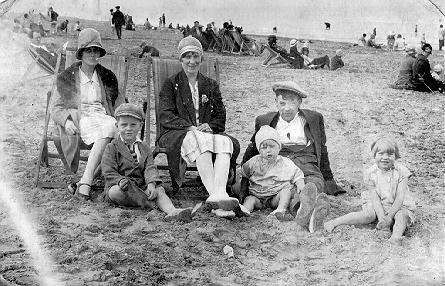 A day out at Yarmouth, aprox 1937, - we all squeezed into a "Charabang" ! 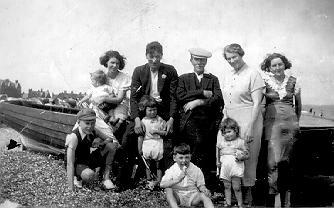 Mam, Dad, Great Grandad, Grandma, Aunty Gert, Edna in Mam's arms, Alan, Hazel Norman and Doris. 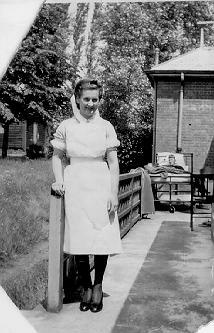 My Aunty Rose at Yarmouth before the Second World War. Uncle Walter was a Stone Mason.